The end of the 2012-13 girls basketball season came early to a Lady Cardinal program that had become accustomed recently to state tournament trips. 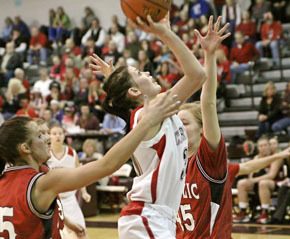 However, following Boone Central/Newman Grove’s 55-38 loss to Mid-State Conference rival Norfolk Catholic in the C1-8 Sub-District at Norfolk Tuesday, Feb. 12, Coach Mike Kennedy noted he was proud of the season-long effort and fight by an inexperienced squad that lost seven seniors from the 2011 team that placed third in Class C1. “I appreciate how hard this team has worked this season and how they continued to believe in each other and in our team,” Kennedy said. “We will miss our graduating seniors again, but will return a much more experienced team next season. Boone Central/Newman Grove again battled hard against Norfolk Catholic Tuesday, but could not overcome the combination of 21 points by Knight star Michaela Barry and BC/NG’s own lack of shot-making. While Catholic was never able to make a decisive run against the scrappy Cardinals, the Knights held an advantage in every quarter, methodically building to the final margin. “It was a very disappointing night for us,” Kennedy said. “Our effort was good, but our execution was not. Jade Gottier and Miranda Ketteler each scored four points for Boone Central/Newman Grove in the first quarter, but Barry led Norfolk Catholic to a 13-9 lead with a 3-point basket and six overall points. Barry added another six and Amy Miller scored five as the Knights went up 27-20 by intermission. Cardinals Shannon Stuhlmiller, Rebecca Reicks and Darienne Pokorny sank 3-point field goals in the second half, but Catholic used scoring by seven players and made 10-of-14 free throws to secure the win.